Your situation is intolerable and beyond reason; you sit in prison for thirty-five years while those who carried out torture, murder and other war crimes walk American streets freely. While many fight to free you, the system is simply stacked against us all. Given these restraints, what are the specific things that we could do or rally around to improve your situation? You can certainly work toward improving my situation by donating to my legal defense fund. We're working on a lot of big issues in my case -- which has the potential to become landmark precedent in the American jurisprudence system -- that affect a lot of people in America. It's so very important that they get help too. Paying the legal bills is the biggest logistical hurdle to that at this point. Ultimately though, keeping me motivated -- because sometimes it can get pretty tough emotionally -- and ensuring that people haven't forgotten just how important this case is for our ensuring that our rights are protected in our society, will certainly work toward that end as well. From a somewhat odd Q&A in Papermag - where some arty-farty types ask Chelsea some rather pretentious questions. Thought the above was the most important bit. You can donate to the Chelsea Manning Defense Fund here. 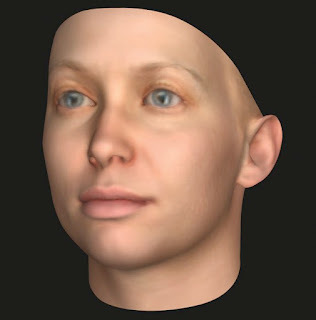 Illustration: Heather Dewey-Hagborg's forensic DNA phenotype of Chelsea Manning.